This is the incredible story of a widespread network lobbying for corruption. Its branches spread out from ‘left-wing’ social democrats in Bucharest, to PR consultants and campaign advisors working for right-wing politicians Benjamin Netanyahu and Viktor Orbán, to Israeli private espionage companies led by former Mossad agents, to neoconservative think tanks in London and even Donald Trump’s lawyer in New York. Sounds like a conspiracy theory? Well, read on and judge for yourself. Last week a strange letter found its way to the desk of the President of Romania. The letter came from Rudy Giuliani, Donald Trump’s lawyer and former mayor of New York. In it, Giuliani made a case against Romania’s National Anticorruption Directorate (DNA). He also urged the president to grant amnesty to convicted criminals. All this comes at a time when PR consultants are busy with a major PR campaign to secure amnesty for businessmen and politicians who were convicted for corruption. They see their chance, now that the Romanian government fired Laura Kovesi, chief prosecutor of the Anticorruption Directorate. ‘The Anticorruption Directorate uses authoritarian investigation methods and it’s our job to defend democracy and the rule of law’, the Minister of Justice said at the time. Over the past five years, Kovesi’s investigations have led to the conviction of more than a thousand businessmen and politicians, among which the most powerful man in Romania: Liviu Dragnea, president of the ruling social democrat party PSD. Romanian protesters want to see Liviu Dragnea, the president of the social-democrats who as convicted for corruption, effectively behind bars. Giuliani’s letter couldn’t have come at a better time for Dragnea. Over the past years he has found himself in increasingly deep waters. A first lawsuit saw him convicted to two years in prison, to which a second conviction added three more years. The accusations range from election fraud, to bribery, embezzlement and money laundering worth millions of euros. Coincidentally, or not, Giuliani mentions exactly what Dragnea needs to be able get elected as prime minister: a ‘full amnesty’ for Kovesi’s ‘victims’ who were ‘convicted through the excesses of the DNA’. In the most unexpected of places stories are published about the need for a full amnesty for corruption in Romania. The reason allegedly being that the Anticorruption Directorate is corrupt itself and is threatening constitutional democracy. The whole lexicon of human rights, democracy, anticorruption, good governance and the rule of law is used to claim that the Romanian government is in fact protecting those values against a secret network with perverse interests. All of it seems like a big PR scheme to spread confusion and raise support for what is in fact a power grab.Klaus Iohannis, the President of Romania and Dragnea’s sworn enemy, knew exactly how to interpret Giuliani’s letter. He knows what’s at stake. ‘Ever since he refused to accept Kovesi’s resignation (until he was forced by the Supreme Court, which is controlled by the PSD), PSD-parliamentarians have been planning his impeachment’, says Sergiu Miscoiu, Professor of Political Science at the University of Cluj-Napoca. Dragnea believes President Iohannis, Laura Kovesi and the intelligence services are part of a so-called ‘parallel’ state, a secret network that uses ‘authoritarian investigation methods’ and is out to ‘use the fight against corruption to undermine Romanian democracy’. Interestingly, the same remarks appear almost verbatim in Giuliani’s letter. He too talks about a secret network: he ‘regrets hearing about the existence of secret protocols between the intelligence services, the Superior Council of the Magistracy and the Anticorruption Directorate’. Many Romanians, including those who are against the government, agree that Laura Kovesi used aggressive investigation methods and that she and the all-powerful secret services are using the fight against corruption to settle political scores. To give weight to the claims that Mueller is just an overzealous prosecutor who is abusing his powers, Giulani is gathering examples of other countries where prosecutors have wrongly prosecuted government officials. The question remains: why does Giuliani give two cents about Romania? In other words: what interests does Giuliani have in Romania? ‘His own interests,’ Professor Moscoiu says. ‘He’s defending Donald Trump in a case about the alleged collusion between the Russian government and the Trump campaign. His opponent: special prosecutor Robert Mueller. To give weight to the claims that Mueller is just an overzealous prosecutor who is abusing his powers, Giulani is gathering examples of other countries where prosecutors have wrongly prosecuted government officials. The American State Department is not pleased with Giulani’s move. The United States have always considered Kovesi one of the examples in the fight against corruption. But if Giuliani is the one advising President Trump on Romania, he may well convince Trump of his narrative. And Trump has been known to give a free pass to regimes that have attacked the rule of law, as long as they do what he wants. ‘The Romanian government tries to save its own skin by keeping the President of the United States on their side’, Kai Jacobsen of the Romanian Peace Institute (PATRIR) says. Giuliani may not give two cents about Romania, but he needs to get his information somewhere. Before Giuliani’s letter came out, think tanks pushing for a ‘full amnesty’ as the ‘solution’ to the institutional crisis in Romania spread a series of op-eds and reports all over the Internet. In an article in Forbes magazine, former FBI director Louis Freeh (Robert Mueller’s predecessor) also talks about ‘secret protocols’. Freeh’s consultancy firm sent Giuliani a report on Romania, asking him to send a letter to the President of Romania. Giuliani confirmed that the Freeh Group paid him to do so. It is unclear who the client is who asked the Freeh Group to approach Giuliani. But last year the Romanian magazine Business Review did write that Louis Freeh is Gabriel Popoviciu’s lawyer. Popoviciu is a wealthy Romanian real estate tycoon who was convicted to nine years in prison in a case led by Kovesi. The consultancy company of former FBI director Louis Freeh sent a report on Romania to Giuliani with a demand to send a letter to the Romanian president. Giuliani confirmed that the Free Group payed him to do so. That shouldn’t come as a surprise: Clark is a PR consultant who also worked for Dan Adamescu, the second richest man in Romania, who was charged with bribing judges in his firm’s bankruptcy cases. After an investigation led by Kovesi in 2016 he was convicted to four years in prison, where he died. ‘Adamescu was an important sponsor for the Romanian social democrats’, Professor Miscoiu says. Think tanks are making a case for amnesty in reports on corruption. From convicted Romanian businessmen and pro-Israeli lobbyists the trail leads all the way to Giuliani. The Henry Jackson Society is a neoconservative British think tank with ties potentially leading to Giuliani. They organised a launch event in the British Parliament for the pro-Israel lobby group Friends of Israel Initiative of the Spanish neoconservative former Prime Minister Aznar, who joined George W. Bush in the invasion of Iraq in 2003, after months of pressure from Netanyahu, the current Prime Minister of Israel. Friends of Israel Initiative is financed by the American billionaire Robert Agostinelli, who also financed Giuliani’s presidential campaign in 2008. To sum up: a British PR consultant working for the Romanian businessman who finances the social democrats, wrote a report for a think tank that works with a pro-Israel organisation that is financed by the same American billionaire who also financed Giuliani. And in that report the PR consultant pleads for an amnesty in Romanian corruption cases. And then the exact same plea is made in Giuliani’s letter to the Romanian President. A series of other op-eds was published in the newspaper New Europe, all of which mention the same report by the Henry Jackson Society. Another report and numerous op-eds by the so-called Human Rights Without Frontiers build further on the report of the Henry Jackson Society. They organised a conference with David Clark as keynote speaker and defended Adamescu, the convicted businessman who hired Clark as PR consultant. They dismissed the trial against Adamescu as a “show trial”, even though not one of the major human rights organisations was involved in Adamescu’s case. They use the word “corrupt” only when talking about Kovesi and the Anticorruption Directorate, never in reference to the government. And the claims made by the minister of Justice are taken as fact. A month before Laura Kovesi’s resignation, the PSD organised a pro-government demonstration, for which they lined up civil servants. They protested against ‘the parallel state’ that ‘secretly uses authoritarian methods to undermine the democratically elected government’. This narrative brings to mind the Polish government party PiS, that explains its policies as a purge of the ‘secret and hidden networks’ of various elitist groups in politics, justice, the corporate world and the media. The fact that we are seeing the same tactics being used to smear opponents in Romania is not a coincidence. There are companies actually specialised in undermining liberal democracies. Netanyahu’s advisors who also worked for Orbán are now advising the Romanian PSD. These advisors are specialised in attack-propaganda. ‘Political strategists’ – marketers, consultants and advisors to governments all over the world – develop these sorts of PR campaigns. 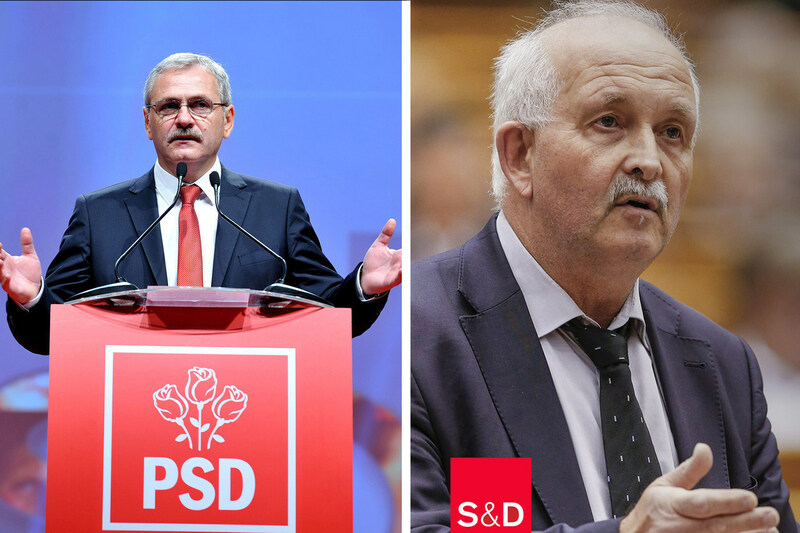 Moshe Klughaft and Sefi Shaked, two Israeli political advisors, worked for the Romanian social democrats during the election campaign. The same advisors also developed the aggressive messages for Israeli Prime Minister Netanyahu, the far-right ultraorthodox Israeli Education minister Naftali Bennet and the right-wing Hungarian Prime Minister Orbán. In return, the Romanian social democrats are willing to do a lot for Netanyahu. Romania was one of the few EU member states that supported president Trump moving the American embassy to Jerusalem. In doing so, it effectively went against the official EU position. They even wanted to move the Romanian Embassy in Israel to Jerusalem, which would mean a violation of international law that the EU still chooses to uphold. Moreover, many Israeli companies are investing a lot in Romania and Dragnea even made sure that stocks in privatised energy companies were sold to Israeli companies. The common denominator between Israel and Romania: Netanyahu is plagued by corruption scandals too. And the Israeli government is experienced in smearing human rights NGOs as well. Arthur Finkelstein, an influential Jewish American campaign advisor who helped Reagan, Netanyahu and Orbán get elected through attack-propaganda and by smearing opponents, also worked for the former Romanian President and a smaller liberal party in coalition with the social democrats. Finkelstein was also responsible for the campaigns against the Hungarian-American businessman George Soros in Hungary. The Israeli espionage company that worked for Harvey Weinstein and Viktor Orbán was hired to spy on the chief prosecutor of Romania’s anticorruption directorate. Antena 3 is owned by Dan Voiculescu, a former politician who ended up in prison for corruption after being convicted in a case led by chief prosecutor Kovesi. The connection to Israel doesn’t stop there. In 2016, two employees of the private Israeli espionage company Black Cube were arrested in Bucharest on suspicion of spying on Laura Kovesi and harassing her family. They were convicted to two years in prison, but were released after a couple of months and sent to Israel. In 2016 two employees of the Israeli private espionage company Black Cube were arrested in Bucharest on suspicion of espionage against the chief prosecutor of the National Anticorruption Directorate. Black Cube is the company that collected information for the American film director Harvey Weinstein on the actresses who had accused him of sexual harassment. Black Cube is the company that worked for American film director Harvey Weinstein, gathering information on actresses that had accused him of sexual abuse. One of its board members is the former director of Mossad. And some young former agents of the Israeli army intelligence service are now working for Black Cube. Black Cube also influenced the Hungarian elections of April 2018, when Viktor Orbán got re-elected. Former Black Cube employees testified about their work in Orbán’s anti-NGO campaign during the elections. Using false identities, the Black Cube spies approached NGOs to tape their conversations and publish them in the Hungarian media. Orbán contorted those conversations and used them in his campaign against the NGOs. Without mentioning a single word about the source of the tapes, Orbán called them the ‘Soros leaks’. The terms ‘Soros people’, ‘Soros mercenaries’ and ‘Soros candidates’ have become well-entrenched phrases to smear people who criticise the government. Propaganda billboards in a Hungarian village Hongaars during a referendum on the so-called “Soros-plan”. This is how the Hungarian government is calling the plan to relocate refugees over different EU-member states. This scandal even alarmed the Hungarian intelligence service, that now knows that the Hungarian government spied on Hungarian citizens with the help of foreign agents. And the same Black Cube also spied on the chief prosecutor of the Romanian National Anticorruption Directorate. The Romanian story teaches us that the populist right does not have a monopoly on working with such companies. Often the ideological narrative about an alleged ‘illiberal democracy’ is nothing but a pretext to shield corrupt and oligarchic interests. And to avoid prosecution. ‘These people don’t have an ideology, only networks’, Professor Miscoiu says. That’s how it is in Romania and that’s how it is in Hungary. Even though Hungarian Prime Minister Orbán puts a much more convincing spin of the ideological pretext. The deeper the corrupt ties between politics and business are, the more is at stake if politicians lose elections or if an ‘overzealous anticorruption prosecutor’ threatens to interfere. Democratic norms and values are sacrificed easily on the altar of corruption. Next ArticleSocial democrats voted in favour of sanctions against Hungary. What about autocrats in their own ranks?